Can Screenwriters really 'Write to Market'? Can Screenwriters really ‘Write to Market’? Screenwriting can be a laborious process. As a spec writer, you can spend months if not years working on a screenplay. That’s a long time to commit to a project, especially considering that until the script sells, you’re essentially working for free. There’s the sense that a spec writer is placing all of their eggs into one basket because there’s the inherent risk that the script you’ve dedicated so much of your time to, isn’t going to be something that producers are currently looking for. Writers who want to stay ahead of the game and try to predict whether their idea will be a sellable one before they even begin, will already be familiar with being told that you can’t foresee what the next big trend will be and if the story is a strong one, your script will sell regardless. With this in mind, how can a writer make a calculated risk when deciding on which of your core concepts will have the best chance of selling? We all know that trends happen in film. First it was vampires, and then it was zombies, followed by an influx of big budget super hero movies that still remains hugely popular today. The difficulty in predicting a trend is that there’s usually one very successful movie that sparks the desire to emulate it in the first place. Capitalizing on a trend involves speed and that’s something that’s not always on a screenwriter’s side, countless poor copies and rip-offs often being the result. When we look at what types of stories are actually selling, no one specific genre ever stands out above the rest. There’s always a wide spectrum of different genres consistently being purchased, meaning that it’s very hard to guess what the next big thing will be. Instead, let’s look at exactly where the ideas for these selling scripts are coming from. It’s no big surprise to find that the vast majority continue to be sourced from already published or produced material. This ranges from movie remakes, scripts based on true stories, and literary adaptations etc. In *Aug 2015, roughly 65% the screenplays sold were based on existing intellectual property, so we can safely assume the remaining 35% were original pitches. Jump forward one year and to Aug 2016 and that number’s changed significantly to 70% being sourced and 30% being original specs. While this decrease in pitch sales may concern some, it isn’t the most interesting stat to look at here. 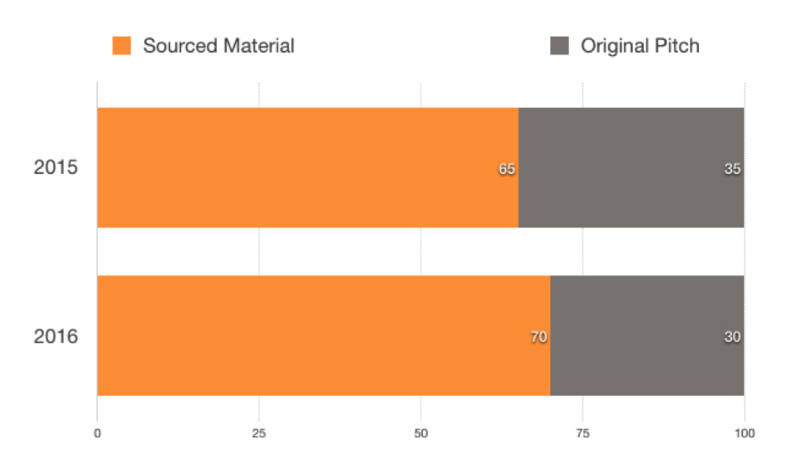 Further investigation at the types of sourced material being bought shows an increase in adaptations made from very recent, current and not even published yet material. A third of the novels being adapted in Aug 2016 were written the very same year, and another third were published during the last four years. This is almost double from the year before! Why is this interesting? Because novelists have been ‘writing for market’ for years and doing it very successfully by following the tried and tested method of analysing what type of stories people are buying, finding a genre that isn’t overly saturated, studying audience expectation, hitting the right tropes and feeding consumers exactly what they want. Considering this development in fast transition from page to screen, is the book fiction market possibly the place that screenwriters should be paying attention to rather than the box office? Could closely monitoring book sales be the key to deciding which script idea will sell best? And should screenwriters be diversifying by writing in both markets to better retain rights and creative control? Either way, the quick turnover from novel into screenplay still relies heavily on speed, harkening back to the original misconception that you can easily write to market by following trends. So be savvy but also be wary. While it can be helpful to be aware of publishing sales, don’t fall into the same trap as trying to duplicate big movie successes too. After all, isn’t it better to be a trend setter than a trend follower?